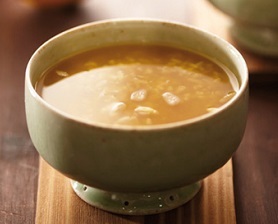 Shikhae is a traditional sweet Korean rice beverage, usually served as a dessert. In addition to its liquid ingredients, shikhae contains grains of cooked rice and in some cases pine nuts. It is traditionally made by pouring malt water onto cooked rice where it steeps in the rice until it floats to the top of the surface. The liquid is then carefully poured out, leaving the rougher parts, and boiled with sugar. In South Korea and in Korean grocery stores overseas, shikhae is readily available in cans or plastic bottles. One of the largest South Korean producers of this drink is Vilac Company of Busan as well as Yalkut Corporation. Homemade shikhae is often served after a meal at Korean restaurants or at home.